The corn was tall and the boy was not, which doubled his sense of exploration. His father had always forbidden him to wander through the fields, even if Jecal followed, and he was only here now because of the panic back home. The boy's father was one of the most powerful slave-owners on the planet. Knowing of the boy's wanderlust and realizing that the exhortations not to explore the fields were little more than inducements, he had trained a slaver hound to follow the boy and protect him. Under most circumstances the slaves treated the boy politely, even when Jecal was nowhere to be seen, but in these troubled times it paid to make certain. A little earlier in the day, the boy had secretly listened in on a meeting between his father and some of the field heads. It had been conducted in hushed tones, and the boy had heard mention only of an "unfortunate accident" and "strange movements on the horizon" that apparently demanded they redistributing the workers and doubling the guard at the palace. There had been disarray, and for once no one had been paying the boy any attention, which was all the opportunity he needed to slip out of the house unseen and head into the fields. Jecal had followed him but the boy sent him off several times, telling the slaver hound that he needed to be seen about the palace so they'd think the boy was there too. Three times Jecal had returned, only to be sent away. 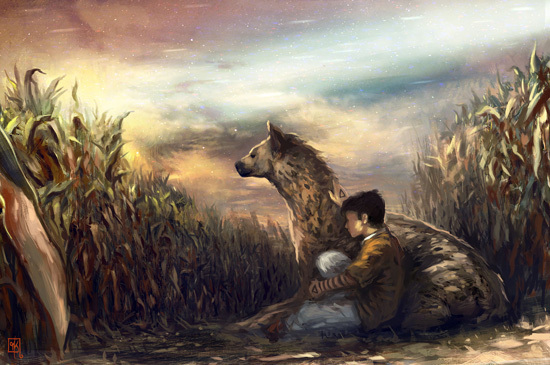 After the last time, he did not return, and the boy wandered on through a large field of corn while feeling the crisp giddiness of being slightly lost in forbidden places. A sound caught his attention, so he changed direction and headed towards it. He pushed through a thick layer of corn only to tumble through and land on empty ground. He found himself on a small plain, an open circle in the middle of the field. In that field were three men, sitting hunched over on wooden stools. They were slaves, and the sun glistened on their black skin. Each man either held a large glass bottle containing clear liquid or had a corked one lying in front of him. At the boy's arrival they all looked up in unison. One of the men hissed slowly and rolled his bottle between his hands. Another one picked up a bottle from the ground, uncorked it with deliberate slowness and took a long drink, not letting his gaze off the boy for a second. The third man, who was bigger than the others, put down his bottle, wove his fingers together and sat absolutely still. He looked at the boy for a while, then looked away and stared at the corn instead. It looked to the boy like he was praying, though the slaves supposedly didn't have any proper religion. The large man kept looking at the corn, but the other two stared right at the boy. He stared back, having been taught not to be intimidated by slaves and not to say anything to them unless they deserved it. He thought he remembered seeing these people before, but wasn't sure, and he didn't know their names. The big one suddenly got up and started walking to the boy, slowly and a little unsteadily. One of the two remaining men also got up, but the other grabbed him and pulled him back down. The one who'd tried to stand up said, "You know what they'll do to us. The Vitoc." The undertones of panic in his breathless tone made the boy even uneasier. "No," said the man who'd pulled him down. "Because we weren't here. Pick up your flask and go." "It won't bring anyone back," the first one said. The other one gave him a hard look and said, "That's not what this is about. We're going now. Don't look back, and don't say any more in front of the boy." As they got up and left, the large man continued sauntering towards the boy. The boy wanted to flee but remembered his father saying that he shouldn't ever bow down to these people. So he stood firm while looking the man in the eyes. The man walked up to him, and the boy smelled sweat and grime and something he imagined was alcohol. He kept looking at the man's eyes and was amazed to see that the man seemed to be quietly crying. The sight transfixed the boy, and as the man started to do something with his hands he paid it no attention. The man's face didn't change at all; the tears merely ran down, like little children left in the fields. At last the boy looked down and saw that the man was slowly unwrapping something. It was an item packed in layers of a thin, shimmering material that the boy thought might be silk. The wrapping was pink, though it had a lot of dark stains, and was the same fabric as a thin, blue cord that had been knotted up and tied around the man's left wrist. As the boy looked on, the man unwrapped the package and took out a knife: a short, solid blade with a handle made of dried leaves wrapped around one end, the type of knife that the slaves often used at harvesting time to husk the corn. The blade was clean and looked very sharp. On seeing the blade, the boy's breath caught in his throat and he began to feel very cold. Forgetting any rule he was ever taught, he looked up at the man and said in a low voice, "Mister, what are you going to do?" Staring at the knife he'd unwrapped, the man frowned and leaned his head to one side, as if being asked to consider an unfavourable business proposition. "Hold still," he said. "Hold still and it won't hurt so much." The boy couldn't move. Everything had become so real that it overwhelmed his senses. The sky was blue and cloudless. The corn smelled of earth and dinners. Things rustled, buzzed, creaked and squawked all around. The man was so impossibly tall he blotted out the sun, and he smelled like hard work. The boy took all this in without thinking about it because anything he could think right now would lead him somewhere he didn't want to be. "Mister, what are you going to do to me?" the boy said again, not wanting to know but unable to think of anything else to say. The man pinched his eyes shut and shook his head as if adamantly refusing a request. He had started crying again and wiped off the tears with the back of one hand while clutching the mottled silk. The other hand held the knife, pointed directly at the boy. Once he'd wiped off the tears and softly cleared his throat, the man leaned over the boy, knife in hand. There was a louder rustle from the corn, followed by a rising growl, and Jecal burst out from the stalks, jumping onto the man and knocking him to the ground. The man swung the knife at the slaver a second too late, and the animal went to work on him with wide open jaws. The boy stood frozen on the spot and watched what Jecal did. When it was all over and the sounds of nature had resumed, the boy regarded what lay on the ground. He knelt beside it, picked up the silk cloth that lay on the trampled corn, and stuffed it in his pocket. He felt that something had been taken from him and that he should take something back, as revenge, or compensation, or simply as confirmation of a memory destined to lie deep. He turned and began walking back home, slowly making his way through the corn with Jecal at his side. He kept touching Jecal as if to ensure himself that both he and the slaver were still there. Once he'd made it halfway to the palace he started to hear the voices of his father's people, who appeared to be anxiously shouting his name. There were noises from the sky and the earth, and gray clouds were amassing overhead. The silk cloth bulged in his pocket.